I find smartphones in general quite difficult to type with, and I’ve been thinking it’d be cool to write more while travelling. Especially as I’m considering photographing some stuff in Scotland as soon as I can afford it. I bought the Samsung Galaxy Note 8 smartphone upon release and I’ve been really happy with it. I wanted a water resistant smartphone with USB 3 speeds for backing up photographs with my Sony a7rII mirrorless camera, and it’s served me well. I can never get along well with a touchscreen for typing a lot though. Things like the Dell 9380 13inch XPS laptops are obviously incredibly nice but they’re also incredibly expensive and quite heavy to hike with for long periods. I can probably get by with a little keyboard for my phone, I think. The screen is fairly small but obviously most of that is taken up with the on screen keyboard anyway. Using a wireless keyboard, you effectively get twice the screen space and I think it moves into the realm of doable. For something like the smallest Apple iPhone, it might be too small but for larger phones like a Samsung Galaxy Note 9, Google Pixel 3 XL, etc. I think it should be okay. 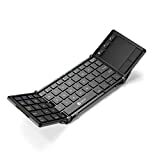 I’ve seen a few models… The Microsoft Universal Foldable Bluetooth Keyboard catches my attention the most. Interestingly, it’s sold slightly cheaper here in the UK than in the states–that’s pretty rare for anything electronic. None of them seem to be waterproof but some have splash resistant keys. At £44.99 here in the UK, it’s cheap enough that you can break it without it ruining your life; nonetheless, it’s expensive enough I don’t really want to break it either. I have a folding case already, which I can use to prop up the phone screen. There’s quite a few keyboards available and the microsoft is the more expensive model, but I typically really like microsoft hardware. 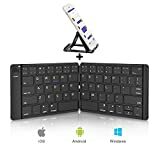 I thought I’d mention these keyboards because it’s hard to keep track of technology and perhaps it’s something you might want to consider. If I get one, I will let you all know what I think of it. I have a few questions: are there delays when typing, does the gap in the middle of the keyboard matter much, and are the keys nice to type on? etc. so on. I currently use a topre, for my PC and I’m a bit spoiled. I’m not sure how much these keyboards weigh in actuality either. For any travel bloggers hiking the Pacific Crest Trail in 2019, you might just have time to grab one! Haha. I think it’s definitely something a backpacker should take a look at. 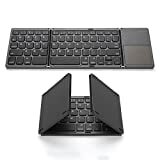 To my knowledge, the microsoft universal foldable bluetooth keyboard works with all phone operating systems that have bluetooth. Last year I went to Canada and it was my first time travelling alone, I loved it! I now have the travel bug, but I can’t really afford to go anywhere expensive. I’m from the UK and I’ve been to all of England but not Scotland. When I went to Canada, my photographs were compromised because I hiked many, many miles each day. I don’t regret my trip at all and I can’t express how much I enjoyed parts of Canada. However, I’d like to take more professional photographs and I have a different goal in mind for my next adventure. This time I’d actually like to hike a bit one day, camp, take photographs the next, and hike the day after or something like that. Whatever I do, I want to make the trip more about photography and less about the hiking. Taking photographs at 2pm? Yeah, not cool (especially with a bear nearby). Do you have any experiences hiking in Scotland? Are there any places you recommend where I can float around the area and no one mind if I camp there? I have another update regarding my new site I’m creating. I’ve made a cool menu system I’m pleased with. I should probably get some screen recording software and show it on YouTube, but hopefully it’ll be done soon. It’s kind of a 3D effect :). You can see it if you follow my instagram and view the story (if you follow me, let me know and I’ll follow you back. I don’t pay an awful lot of attention to instagram). When my new website is done, I can go back to taking photographs. At the moment I’m coding day and night, haha. I feel a bit ashamed with this site, because it’s a bit sloppy. After a while, I would really like to make a new theme for it but obviously income comes first. When I make the new theme, I’ll completely remove the portfolio page from it and use my other site to display my photographs. This has a lot of bugs in general, although it displays okay on a 1920 x 1200px screen. My absolute dream would be to get good enough at landscape photographs such that I can sell them in an online store, and then travel for half of the year, haha. I think I’ve been watching too much YouTube. Running this site has been a bit of an experimental process for me. Writing reviews has taught me that it requires a lot more effort than I realised, and as much as I’ve discovered what I want to do, I’ve also discovered what I don’t want to do. I had a lot of fun adventures and experiences in Canada last year but I never really wrote much about them. I don’t want to make the same mistake again. Unfortunately, I kind of turned this site into more about reviewing equipment rather than actual blogging. That’s what happens when you don’t have a clear plan, I guess. At the time of making it, it was to write a bit about the Pacific Crest Trail in America. I wish I recorded audio notes while travelling in Canada or had a laptop with me and wrote a little each night (I should have done that), and then left my laptop at hotels / friends, when hiking. I’m quite good at writing stories and whatnot, so I think I’d be okay at it. I am terrible when it comes to writing reviews though, haha. I guess reviews are structured differently and I’ve had education regarding writing stories but not when it comes to writing reviews. I’m currently working on a business website, for interior photography. I’ve learned it’s something that comes to me way more naturally than other types of photography. For now, my goal is to complete that website and create a portfolio for interior photography only. When I’ve done that, I’d like to change the direction of this website a bit. I will start to write actual blog posts when I travel but I’ll keep on writing reviews. I’ve gradually been improving their quality but they need to improve a lot more also. Lastly, unrelated but a while back I bought a Breakthrough Photography 6 Stop 52mm X4 ND filter. I was really impressed with it. I have recently ordered a Breakthrough Photography X4 82mm CPL filter. I’ll let you all know what I think of it :). Hey everyone :). I haven’t really written about Canada much on my website, I mean, I wrote about it lots prior to going but not actually about my travels. I have started writing a bit about it. Excuse the title, the two are unrelated. On the gear front… I sent my Sony 24-70mm f/2.8 gm lens to be repaired because the zoom ring initially felt and continues to sound gritty. I suspect dust got into it when it was manufactured, I’m not sure. Anyway it arrived, after 3 weeks, seemingly the same as before it left i.e. the fault hasn’t been fixed. In my opinion, it needs one of the gears to be cleaned with alcohol and re-greased. This kind of thing was common with radio controlled helicopter servos and that kind of thing, back in the day. I could do it myself if I wanted to break warranty and if I lived in a dust free environment (I don’t). I don’t have a high opinion of big companies when it comes to customer service, and I don’t see Canon as superior to Sony. I can’t write much about this just yet because I don’t have the full story to tell. My advice for things like this is to know the law in your area, know your rights, and don’t put up with rubbish if you don’t have to. I waited three weeks to receive the lens and they now want to send it away again. I consider that unreasonable and I have questioned them as to what they’re going to do now. I’m very unbiased and I don’t hate on companies, but this is something I feel large companies should sort out in general. One way this could be done is for them to request information about the fault and actually READ that information. I ordered a Sony 12-24 FE lens for interior photography. It arrives tomorrow, I hope! I am looking forward to it. I will be using it a lot, so I’ll have a lot to say about it and if you have any questions, let me know. I’ve been reading photography forums too much the last few days, trying to decide what lenses/lighting to buy. They are a wash with information/discussions about the Nikon Z 7 and the Canon EOS R, full frame mirrorless cameras. A few features have been discussed, like the larger mount of the Nikon Z 7. Unfortunately with the internet, if enough people say something is true, then for some reason everyone thinks it’s true. Very early on, people argued the Sony e-mount was too small. To this day, I haven’t seen evidence this is true. Another argument that caught my attention was about cleaning sensors and how the Canon EOS R will close its shutter when you change lens. I’m not 100% sure how I feel about this. I think it’s a step in the right direction, but if dust hits the shutter and it gets jammed in the mechanism, that’s going to be expensive to replace. Touch wood, I haven’t needed to clean the sensor (actually, you’re cleaning toughened Schott glass cemented to the sensor). Sometimes it’s hard to tell where the wind is coming from, so I lick my finger and hold it up (this is a trick I learned when flying radio controlled planes/helicopters). Yeah it looks weird for a second, but that’s the direction the dust/rain is going to come from. I then turn my back to said direction, and switch the lens. To switch the lens, I unscrew the cap on the top of the lens I’ll be using but I leave the cap on it. Then when I dismount the lens on the camera, I can quickly switch caps and lenses, without having to be unscrewing things. It might seem like a minute point but it has worked for me, so far. I don’t care much for the “Nikon is better than Sony!” or “Sony’s an electronics company, not a camera company!” arguments. These companies get our money, we shouldn’t have to support them with verbal loyalty. They should be the ones trying to be loyal to us :). That said, I don’t whole-heartedly support Canon’s choice yet. It might work, it might be more prone to failure. What I’d prefer to see is perhaps a second shutter-like mechanism cover the sensor. As per my last post, I’ve been researching equipment to buy. I think I’ve decided on getting Godox flashes as I’ve been satisfied with them before and they’re cheap. If Broncolor made a Profoto B2 equivalent, I’d be interested; however, the Profoto B2 is overpriced for something that doesn’t colour match with their own B1 flash. On the lens front, the Voigtlander 12mm and the Voigtlander 15mm combined are a similar price to the Sony 12-24 FE Ultrawide Zoom lens. I already own a 24-70 GM and a Zeiss Loxia 21mm f/2.8, so ideally I’d get primes. But… But. The Voigtlander lenses aren’t as sharp as the zoom. The colours and flaring are probably better, but sharpness and versatility will be quite important for interior photography. The weight, for landscape photography, is also really important. At 565g, it’s very lightweight compared to the competition. I think comparisons are a bit silly because a 50mm f/2.0 lens might be completely different to another 50mm f/2.0 lens for example, so just because they’re a similar/the same focal length, we shouldn’t always compare them. We should perhaps compare what we’d realistically buy if we were invested in another system. With that said, if I was with Canon, I’d be looking at the 11-24mm and that’s a 1180g lens. Combine that with the weight savings from the Sony camera, and that’s a major difference. Theoretically it seems possible there could be a Sony 12-24mm f/2.8 G master lens at a similar weight to the Canon. It’s a real let down the 12-24 doesn’t accept filters, so if such a lens were to be announced at Photokina 2018, I’d be interested in that too. In an ideal world, Zeiss would make something like a Zeiss Loxia 12mm f/5.6 or a Zeiss Loxia 15mm f/4. I haven’t heard any rumours about such lenses being made.